Beowulf (c. 700-1000 A.D.) is a heroic epic poem. At 3,182 lines, it is notable for its length in comparison to other Old English poems. It represents about 10% of the extant corpus of Old English poetry. 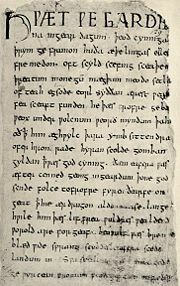 The poem is untitled in the manuscript, but has been known as Beowulf since the early 19th century. 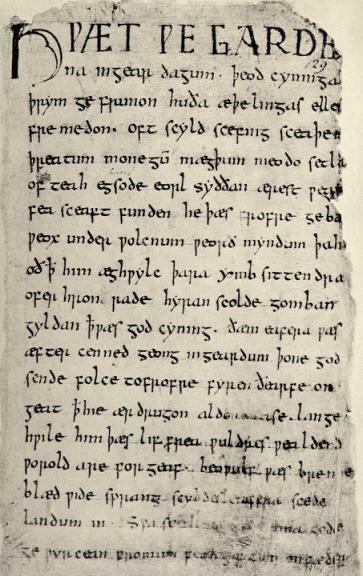 Scholars argue that Beowulf can be divided according to the three main battles of the poem. Beowulf begins with the story of King Hroðgar, who built the great hall Heorot for his people. In it he, his wife Wealhþeow, and his warriors spend their time singing and celebrating, until Grendel (angered by the singing) attacks the hall and kills and devours many of Hrothgar's warriors. Hrothgar and his people, helpless against Grendel's attacks, abandon Heorot. Beowulf, a young warrior, hears of Hrothgar's troubles and, (with his king's permission) leaves his homeland to help Hrothgar. Beowulf and his men spend the night in Heorot. After they fall asleep, Grendel enters the hall and attacks, devouring one of Beowulf's men. Beowulf, feigning sleep, leaps up and grabs Grendel's arm in a wrestling hold, and the two battle until it seems as though the hall might fall down due to their fighting. Beowulf's men draw their swords and rush to his help, but there is a type of magic which aids Grendel and makes it impossible for swords to hurt him. Finally, Beowulf tears Grendel's arm from his body and Grendel runs home to die. The next night, after celebrating Grendel's death, Hrothgar and his men sleep in Heorot. Grendel's Mother appears, however and attacks the hall. She kills Hrothgar's most trusted warrior in revenge for Grendel's death. Hrothgar, Beowulf, and their men track Grendel's Mother to her lair under an eerie lake. Beowulf prepares himself for battle; he is presented with a sword, Hrunting, by a warrior called Unferth. After stipulating a number of conditions (upon his death) to Hrothgar (including the taking in of his kinsmen, and the inheritance by Unferth of Beowulf's estate), Beowulf dives into the lake. There, he is swiftly detected and attacked by Grendel's mother. Unable to harm Beowulf through his armour, Grendel's mother drags him to the bottom of the lake. There, in a cavern containing her son's body and the remains of many men that the two have killed, Grendel's mother fights Beowulf. Grendel's mother at first prevails, after Beowulf, finding that the sword (Hrunting) given him by Unferth cannot harm his foe, discards it in a fury. Again, Beowulf is saved from the effects of his opponent's attack by his armour and, grasping a mighty sword from Grendel's mother's armoury (which, the poem tells us, no other man could have hefted in battle), Beowulf beheads her. Travelling further into the lair, Beowulf discovers Grendel's corpse; he severs the head, and with it he returns to Heorot, where he is given many gifts by an even more grateful Hrothgar. Beowulf returns home and eventually becomes king of his own people. One day, late in Beowulf's life, a man steals a golden cup from a dragon's lair. When the dragon sees that the cup has been stolen, it leaves its cave in a rage, burning up everything in sight. Beowulf and his warriors come to fight the dragon, but only one of the warriors, a brave young man named Wiglaf, stays to help Beowulf, because the rest are too afraid. Beowulf kills the dragon with Wiglaf's help, but dies from the wounds he has received. The dragon's treasure is taken from its lair and buried with Beowulf's ashes. And with that the poem ends.